It’s hard for investors to accept when a company is too expensive. I’m not suggesting that investors try to time the market, but some common sense does need to be applied when looking at what stocks to buy and sell. There is a great brand that is known the world over, but just because a company has a great brand, doesn’t mean the stock is a buy at any price. 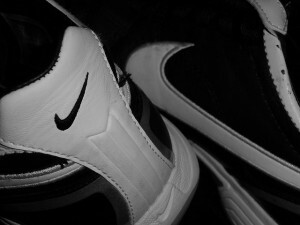 Unfortunately, it looks like difficult times are ahead for shareholders of NIKE, Inc. (NYSE:NKE). If this were ten years ago, it would be hard to argue that Nike was a company facing serious competition. The company used to have an ongoing battle with Reebok, and of course other companies have been around for a while too, but ten years ago, two of Nike’s biggest threats didn’t exist. When NIKE, Inc. (NYSE:NKE) was free to produce shoes and apparel that didn’t have an equal, the company could charge what it wanted. I remember clearly when Nike produced some of the first “Air Jordan’s” and there were millions worldwide who didn’t care that these shoes were $150 a piece. However, Nike isn’t alone anymore, and the competitive threats of Under Armour Inc (NYSE:UA) and Lululemon Athletica inc. (NASDAQ:LULU) are real and growing every day. One of the challenges facing Nike is, the company is very reliant on the North American market. While it’s true that Nike is a global brand, nearly 62% of their total earnings before interest and taxes comes from North America. The reason Nike’s reliance on the domestic market is an issue is, both Under Armour and Lululemon are growing much faster than NIKE, Inc. (NYSE:NKE) in North America. Under Armour has tremendous growth prospects worldwide, but in the last quarter, 94.1% of their sales came from North America. Lululemon Athletica inc. (NASDAQ:LULU) saw 61% of their sales come from the U.S., and 34% from Canada in the last quarter. These two disruptive companies have already cut Nike’s sales growth, and as they become bigger brands, this challenge will only increase. The second challenge facing Nike is, an increasingly difficult environment in the footwear industry. Not only does Nike face the very real challenge of trying to one-up Under Armour Inc (NYSE:UA) in footwear, but both companies face numerous other foes. Consider that Amazon.com, Inc. (NASDAQ:AMZN) currently carries 19,285 choices of athletic shoes priced between $50 and $100. If you begin to consider the number of competitors, the choices are dizzying. Old challengers like Reebok, Adidas, and New Balance still exist, but they are joined by ASICS, Skechers, Vans, and newer entrants like Teva and even Crocs, Inc. (NASDAQ:CROX). With so many choices, and each company trying to compete with better products, NIKE, Inc. (NYSE:NKE) is the category leader that everyone is aiming for. I’m sure some investors are thinking, I’ve heard all of this before. They may even think, Nike has faced serious competition in the past, and is still doing well, what’s different this time?